Duo Asteria was founded in February 2015, almost by chance, by the desire of two young musicians Corinna Hentschel and Giulio Poggia to make as much chamber music as possible. From the outset there was an obvious mutual musical and personal empathy between both musicians. 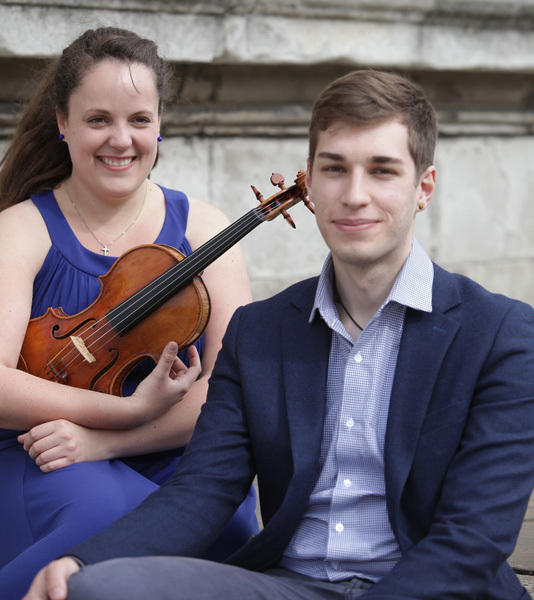 They created and played demanding recital programmes in many different venues, such as the Wigmore Hall as part of Trinity Laban chamber music project, the Polish Hearth Club, Kensington, St George’s church Beckenham, St James’s Paddington, ORNC Chapel Greenwich, St Peter’s Church Nottinghill and many other venues. Giulio and Corinna are very fortunate to have Derek Aviss OBE and Ofer Falk as their mentors and to have had the opportunity and experience to working with Tasmin Little OBE in a performance masterclass. As well as performing in St George’s Festival for Beckenham 2016, other engagements for 2016 include a performance at St Martin in the Fields, where they appeared in the 2015/16 Lunchtime Recital Series. The duo is in demand to perform regularly around the UK and Germany. German violinist Corinna Hentschel graduated in 2016 with a Master in Chamber Music Violin from ‘Hochschule für Musik und Theater Rostock’, Germany in the class of Holger Wangerin. She also holds a Performance Diploma, as well as an Educational Diploma from the same school. Her love of chamber and contemporary music has brought her to form the Duo ‘HENTSCHEL-Sisters’ with her sister Simone, who plays percussion. Together, they have played at festivals in Germany, Netherlands and Slovenia. 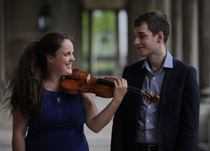 She has also founded Duo Asteria with her colleague Giulio Poggia on piano. Together they perform regularly around the UK and Germany. Since 2015 cellist Derek Aviss OBE has been working with the duo. In 2014 she played with Gilad Atzmon & The Orient House Ensemble. She plays with the Oxford Philharmonic Orchestra. She has performed in Germany, Europe and USA as a soloist, chamber musician and as a member of different orchestras. Corinna has won the ‘Hans Kauffmann Foundation’ special price for chamber music (trio) in the ostracised music competition in 2010. She is also a scholarship holder of the ‘Yehudi Menuhin – Live Music Now e.V.’ foundation and the Lions Club Kaarst-Büttgen-Korschenbroich. Corinna has been granted an Erasmus Scholarship for 2014-15 for MMus Performance studies with Ofer Falk at Trinity Laban Conservatoire of Music and Dance in London and has received the MMus degree. She has led the Trinity Laban Symphony Orchestra and performed as a soloist at the London Handel Festival 2015. Italian pianist Giulio Poggia graduated from the Conservatorio “Arrigo Pedrollo” di Vicenza at the age of 19 after only seven years of study. 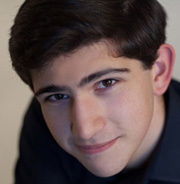 He comes from a non-musical family and he decided to study piano at the age of twelve, after hearing for the first time a record of Beethoven’s music. Always described as talented and promising by his teachers, he developed quickly and has studied with many pianists, among whom Renato Maioli, Stefania Redaelli, Riccardo Zadra, Federica Righini, Martino Tirimo, Eugene Asti, Douglas Finch; he also attended many masterclasses held by well-known musicians, such as Pascal Roge, Christiane Montandon and Wolfram Schmitt-Leonardy. He is also being coached by Professor Derek Aviss OBE, cellist and previous Principal of Trinity College of Music. In London he performed compositions by living composers, such as Adam Gorb, Luis Serrano Alarcon and Richard Rodney Bennet, with the Wind Orchestra of Trinity Laban Conservatoire of Music & Dance at Blackheath Halls; and a solo recital with an all water-related programme at the National Maritime Museum for the Turner and The Sea Exhibition. He also had the pleasure to be selected to perform Takemitsu’s Riverrun as a soloist with the TLSO, conducted by Garry Walker. Giulio is currently doing his Master of Music degree, studying with Philip Fowke, at Trinity Laban Conservatoire of Music & Dance, supported by a Scholarship offered by the school.